1. In this modern bathroom there’s a wooden bathroom vanity with open shelving, that has double sinks with tall rectangular mirrors above each one. A glass shower surround allows the light from the vertical windows to pass through and fill the room, while stone tile adds a soft natural touch to the space. See more photos of this apartment, here. Designed by Lucas y Hernández-Gil. Photography by Adriana Merlo (Batavia). 2. Biasol designed Hutch & Co, a cafe and restaurant in Melbourne, Australia, that combines black elements like window frames, tiles and metal work with light wood and white furniture, and concrete floors. 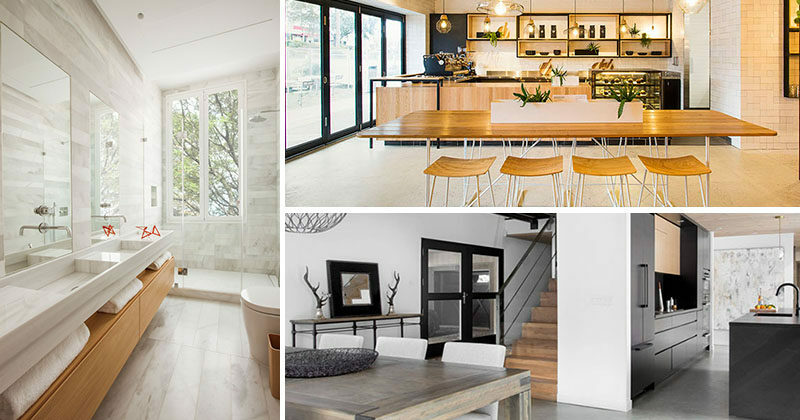 See more photos of modern coffee shops, here. Photography by Ari Hatzis. 3. This modern chocolate shop and cafe design with two levels, has walls with ‘dripping dark chocolate’ and white pendant lights representing ‘milk drops’. See more photos of this project, here. Designed by Bro.Kat studio. Photography by Radoslaw Kazmierczak. 4. 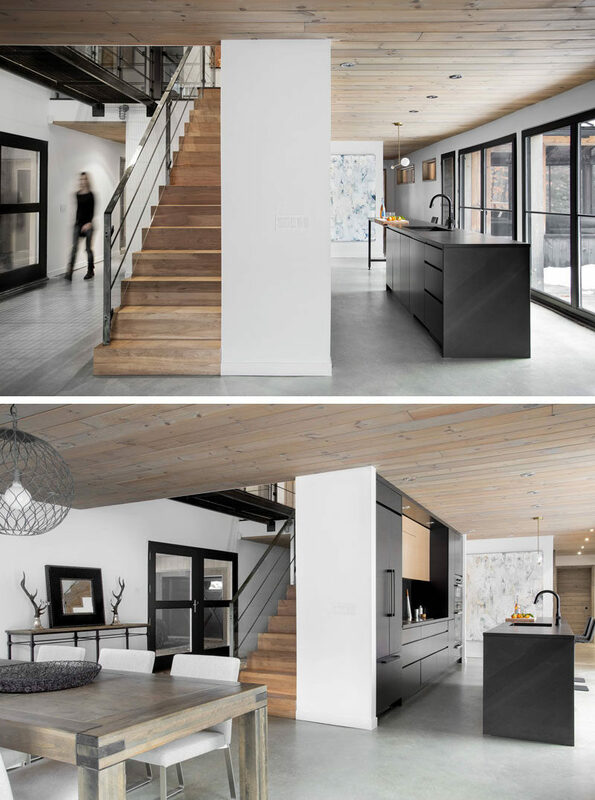 This modern black kitchen stands out against the light floors and white walls, as well as the stairs, and fits right in with all of the other black elements found in the home. See more photos of this kitchen, here. Designed by Catlin Stothers. Photography by Drew Hadley. 5. 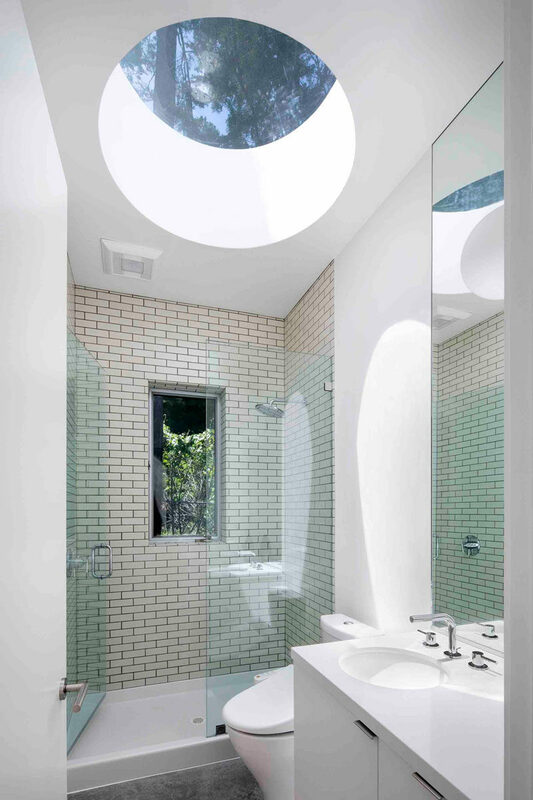 In this modern bathroom, a large circular skylight adds a lot of natural sunlight to the space, while the white walls and white vanity have been paired with a cream-colored rectangular tile to help reflect the light. 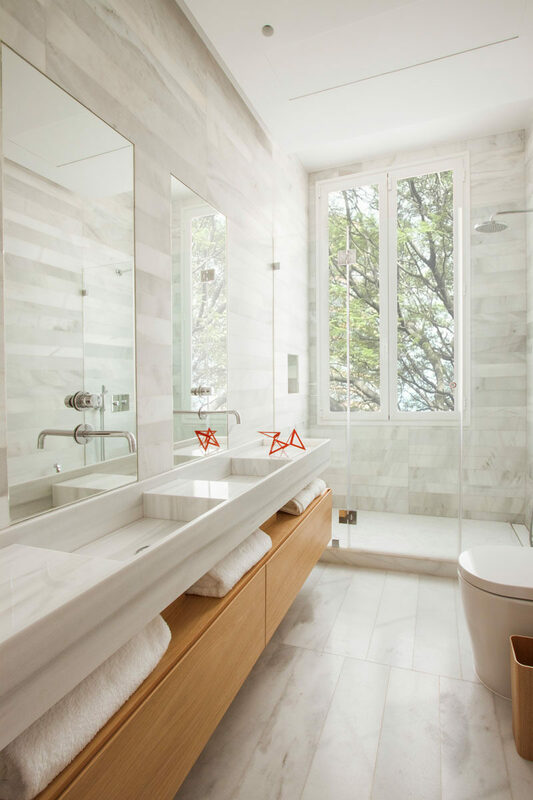 A glass shower door keeps the rest of the room dry, and a small window lets you look out into the trees as you are showering. See more photos of this guesthouse, here. Designed by Turnbull Griffin Haesloop Architects. Photography by David Wakely.